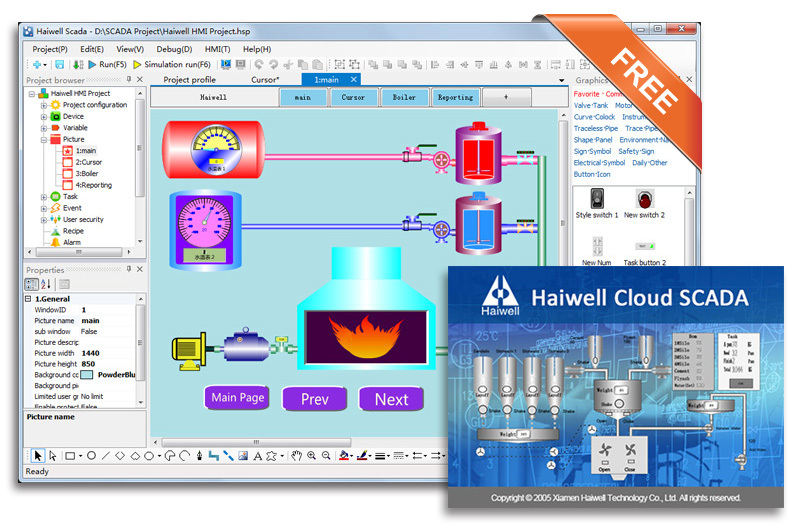 Cloud SCADA-Xiamen Haiwell Technology Co., Ltd.
Haiwell Cloud SCADA is NET-Framework based industrial automation monitoring and management platform developed by Xiamen Haiwell Technology Co., Ltd. Also it is the programming&management software for Haiwell HMI. The industrial site condition can be observed directly to do real-time monitoring through the various primitives and bitmaps of the picture. Communicate with all kinds of industrial control equipments, monitor by acquisition of production signal from the industrial site. The alarm notice about the industrial site can be sent by picture，computer voice，Wechat,，SMS, mail, ect to the relevant personnel. The network engineering enables that different projects can be client or server to each other, by sharing the data,the distributed control can be realized. Record and store data. Make an analysis of real-time data and historical data to solve the production problems, improve production efficiency and improve product quality, etc. Avaliable to set security control level for project(such as security level, user level,etc), which can improve the security of the project. Available to run in simulation, which ensures the project not to be affected by the actual devices. And it can be tested in the software, shortening the development cycle. CPU：1.2 GHz PC or higher version, 2.4 GHz PC or compatible version. Memory：512MB or higher, suggested 1GB. Hard Drive：20GB or higher, suggested 80GB. Display：Resolution 800 x 600 high color 16-bit or higher，suggested 1024 x 768 high color 32-bit. OS：Windows XP SP2 or higher version. Step 1: Double click the "Haiwell configuration software development environment"
Step 2: Click “New Project”, and confirm the project settings. Step 3: Expand the plc node and find the haiwell plc node,do the settings and then click "add" button. Step 4: Choose“Yes” in the reminder window to add the variable. Step 5: There is a default home screen when create a new project,here we can edit on the main home screen directly,the image element can be dragged to the home screen window and do the settings. Step 6: Click the "Compile" in the toolbars, the user will see a pop-up window of saving project,save project to target place. Close the "Compile" window after checking that there is no error or warning. Click the "Simulation run" of the toolbar and enter the configuration software running environment to run the project.